I wrap my pointer finger and thumb around the metal handle of the mint-green rice cooker and grip the switch. The heat reaches my skin and I yelp in pain. My mother is teaching me how to cook rice for the first time, and though she has warned me multiple times (â€œxiao xin!â€) to be mindful of the hot appliance, her words fall short of my distracted, adolescent ears. I wanted macaroni and cheese and cartoons, not to help cook bland white rice for dinner. I craved plastic Barbie dolls, frozen treats, and Britney Spearsâ€™ newest CD. 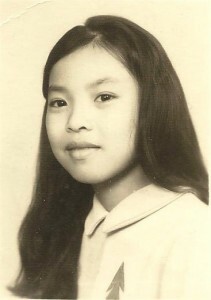 I was the spitting image of my mother, straight jet-black hair and dark eyes like crescent moons, yet she and her Taiwanese customs were so foreign to me. My motherâ€™s first time in a plane was Aug. 13, 1987, when she and my father, then married for just one year, embarked for America. My ah-zhou, my mother’s grandmother, had splurged on the rice cooker as a gift for my parents as they set out on a new life in a different country. The youngest of six children, my mother rarely owned new things, and the sight of the brand-new cooker had filled her with pride and excitement for the future. My mother had wanted to move to America for years. For five years after graduating from the top university in Taiwan, she taught 7th-9th grades in an urban Taiwanese junior high school. Working under a principal whose chief concern was for students to pass the national exams, my mother defied authority in attempts to teach and motivate her students to want to learn. She took her students on outdoor field trips in place of mandatory study sessions. After one too many scrapes with the administration, my jaded mother resigned from the school. She took the money she had been saving up from the job, and with my father, who was eager to leave a boring stint at a credit card company, bought two tickets to the United States. She was intent on getting a masterâ€™s degree in education and starting a family. One month into a teaching degree at the University of Detroit, however, my mother dropped out. Her perseverance paid off. Twenty-three years later, this same rice cooker sits barely noticeable in the corner of our kitchen, just below the microwave that gets on average five times more usage. Some days we use it, some days we don’t. Many days, when Iâ€™m home on break and my mother is too busy teaching hundreds of students in her Kumon after-school math and reading program center, I am the one to flip the switch on the rice cooker to make dinner. It took me long enough to appreciate the simplicity of a well-cooked bowl of long-grain white rice, just like it took me awhile to appreciate the unique unfamiliarity of my motherâ€™s culture. The bowl of rice that so often sits in front of me on the kitchen table when Iâ€™m at home is a symbol of the way in which my mother preserves her identity, and she has passed it on to me. I want to treasure it and savor each individual morsel. And on some days, when my mother is feeling adventurous, she and I crack open a pack of Oscar Mayer hot dogs and slice a couple into our fried rice dinner.